Potatoes are and always will rank amongst my favourite vegetables. The humble spud is flavoursome, versatile and about as frugal as it is possible to be. However, in some ways sweet potatoes are superior to traditional tatties. Indeed, one of their most endearing qualities, if a vegetable can be endearing, is that their texture is naturally more buttery and pleasant than that of one’s average tater, whatever the variety. 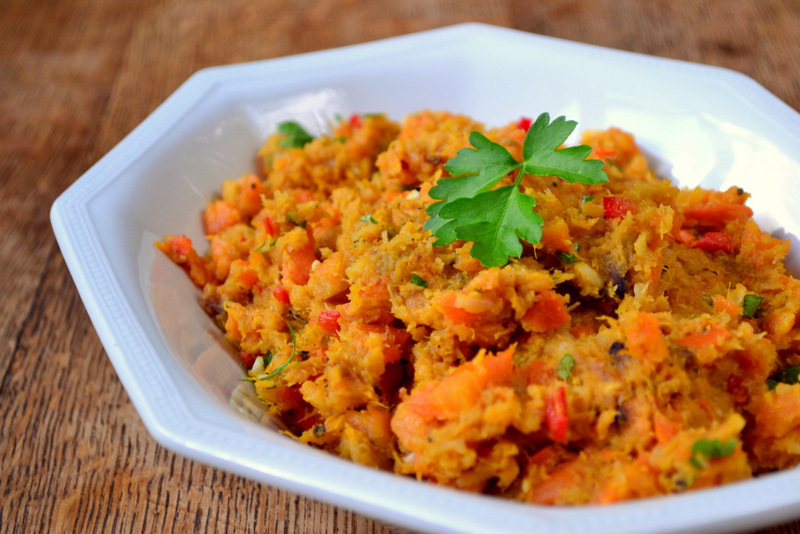 The benefit of this is that sweet potatoes mash incredibly well, without the need of a plethora of dairy products. Even without butter or milk, this mash manages to delicately caress one’s tongue – to me it seems like pure madness that some similar recipes insist on incorporating double cream! Then again, this is a place for the frugal, so that would have to be my reaction! 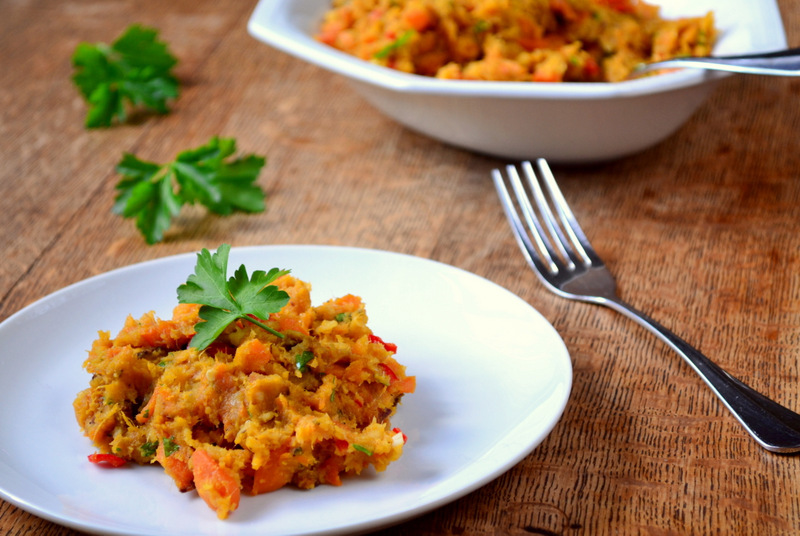 Of course, the fact that this mash is best eaten vegan isn’t the only benefit to be had when choosing this recipe over its more traditional rival – since it naturally possesses a great deal of flavour, it has little need for additional extras. As a result, it can be served on its own as a starter or main – a particularly frugal characteristic. As you can see, the once dreaded parsnip has again made its presence felt. Though their unadulterated flavour has a lot to answer for, they do possess a certain nutty sweetness required by many an autumnal dish. There’s every chance that I’ll one day be won round to the unassuming ‘snip, but for now they must remain partially veiled behind curtains of largely orange fare. Besides, there are many ingredients I’m not overly fond of, ingredients which often add a unique dimension to the dish in which they have been used. Moreover, it just so happens that those unloved vegetables are often the most frugal – who knows what will be next, the turnip perhaps? 1. Pop the vegetables in an oven dish, drizzle with olive oil and bake until soft (20-30 minutes). 2. 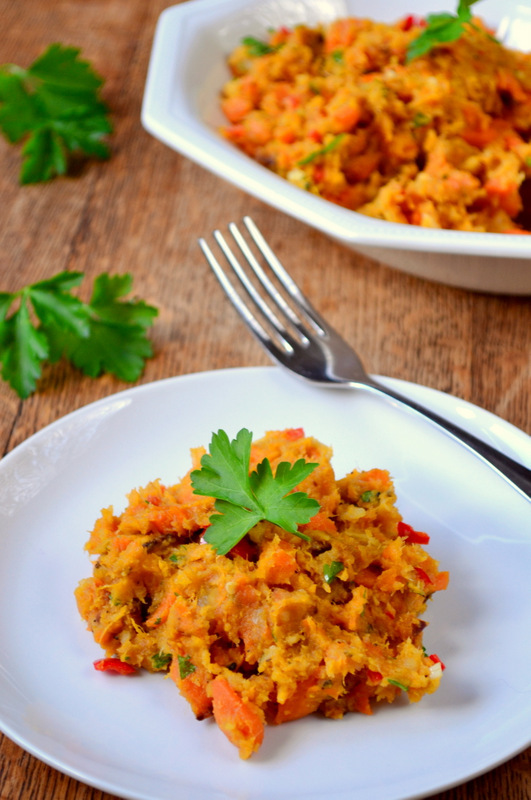 Put the cooked vegetables into a large mixing bowl and mash, leave some lumps. Mix in the chilli, garlic and parsley, stir in a little olive oil if the mash is stiff and season to taste. Serve as an accompaniment to a meal, or alone. Cost: Like I always say, vegan food is extremely frugal and this mash succeeds in continuing to prove that rule. This healthy meal should set one back no more than a rather economical 90p – an enticing prospect, I think you’ll all agree. Oh and it’s perfect for thanksgiving! I love the addition of the chili. Not sure how many American would take up your wonderfully savory sweet potato mash over the vile dish so often served at Thanksgiving that involoves sugar and marshmallows. I will definitely be giving this version of mash a go as I especially like the roast aspect of this. LOL- you are right! The marshmallowly-sugared sweet potato is overdone here in the states! I for one LOVE savory, and usually make my sweet potatoes with fresh ginger and fresh orange juice 🙂 That said, Frugal, you once again have made my stomach growl. The mash is lovely!! Agreed! A very odd concept for New Zealand and Australians, who love sweet potato (kumara) and pumpkin solely as the savory vegetable (fruit!) that it should be! I abhor marshmallow-covered sweet potatoes! I’m trying to win my family over to savory with a brown butter sage sweet potato dish this year. Wish me luck! Tell me about it and I’ve not even tried it! Good luck! Oh absolutely – in every way better! As an American I have to say, the sweet potato-marshmallow dish is a travesty, a mockery of all that is right and good in this world. We’re not all mired in marshmallow, you know. Do it! I’ll definitely work turnips out – don’t you worry :D.
This would make a good side dish for pork. Yummy and thanks, I have an idea for dinner now! cheers! No problem! I’m glad I could be of service! Updating the Thanksgiving menu now! Keep the vegan recipes rolling… I’d love too see what you do with a turnip! Haha – perhaps, but I can’t ever see us being firm friends! Root veg dishes are becoming firm favourites here. They have a wonderful simplicity to them – healthy, nourishing, filling and frugal. Fantastic. Fantastic! They are exactly that! I get the feeling he would have :D. I’ve had the white fleshed variety… not as nice. Good luck, brave soldier! I’d definitely put my body in the line of fire to get sweet potatoes! It looks delicious and photographs are stunning! Parsnips, I think, are highly under-utilized and I am thrilled that you have used them in this recipe! This is going to be a nice substitute for the regular mashed-potato dish. This is *exactly* my kind of Mash! Plain ol’ mashed potatoes are good, but I adore sweet potatoes. Also, I cannot stand sweet potato dishes that are loaded (I mean, just brimming) with butter, cream, sugar, etc. Then, as if that isn’t enough, people top it with marshmallow… *sigh* I will never understand it. At our Thanksgiving table my mom would always make mashed rutabagas (or yellow turnips) – they’re kind of like the sweet potato of the turnip family. You might like them! In the UK a rutabaga is called a swede and seem much more commonly eaten then in the US. I’m glad we’re on the same wavelength, Willow! Perhaps I would like them… hmm… I’ll keep an eye out! This sounds delicious and I just love the colour! Looks perfect for Thanksgiving – easy to make, light on the pocketbook, colorful. Nicely done, FF. Thanks! Exactly – I’m glad I have the Vegan seal of approval! That’s hilarious! We both posted mashed vegetables on the same day! I love your addition of the red chili. Plus all the lovely colors. Beautiful!! Yum! I may try this on the weekend. Thanks – it went down really, really well! Gorgeous color. That mash would be right at home on any Thanksgiving table this week. Nice job! Hey-o! I love parsnips, and turnips, and of course sweet potatoes, so bring on an endless parade of root vegetable medleys, and I will be supa puhhhleased! I love it! I am all about colour on your plate right now and this is a perfect example! And SOOOO cheap! Excellent! Fantastic! I’m so glad you like it! 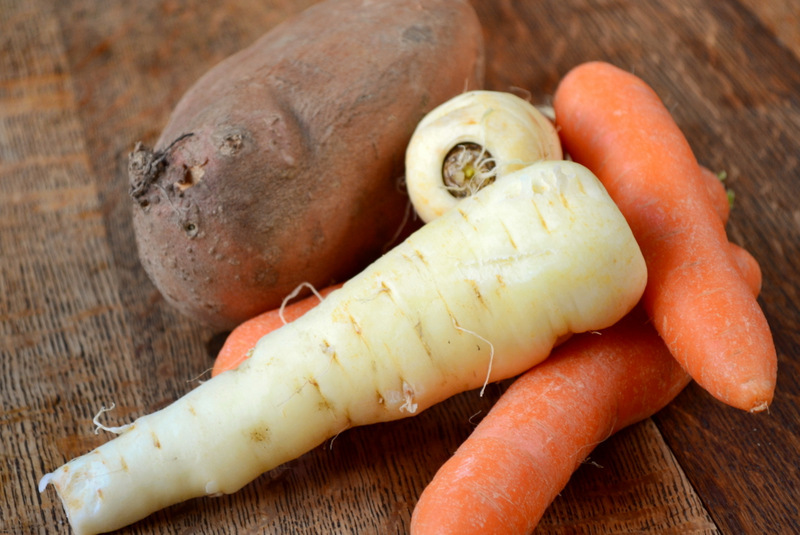 I love mashed sweet potatoes – but I’m liking the sound of all these lovely root vegetables together! Looks awesome! They all compliment each other VERY well! Now this is my sort of mash, carrots, sweet potatoes.. and I do love parsnips (I know I’m strange).. but only when they’re mashed or if they’ve got something sweet added to them. This is so healthy.. a great vegan meal! I thought you might like it :D. One of my favourite vegan meals yet! Try a root veg soup. It is the only use I have had for a turnip yet. Perhaps someone can come up with something else that will win me over. Thanks for the suggestion – unfortunately the turnip bit the dust, it was getting mushy so I composted it! I shall have to try it, yes! I’d just rather not us it though :D.
Potatoes for President!! I love that it is chunky and not completely mashed. And a confession: I tried parsnip and turnip for the first time a week ago.. Always the last to know things..
Haha – that would be an interesting presidency! turnip isn’t that nice… what did you think? Soup is the best way to eat most things! Normally I totally agree with you that plenty of things can be done frugally and done well – e.g. I happily munch on some savoury semolina/masa harina topped with some stirfried mushrooms or greens and a sprinkle of parmigiano and some black pepper and don’t feel I am missing out on the ‘real’ Polenta experience and all the butter that it comes with … but mash without butter, hmmm. Admittedly, at home I often leave out the butter (precious baking ingredient) and the cream (the remainder of which will only go off in my house unless I remember to make some truffles) … but the other day when I went for dinner in a little French bistro I had the creamiest and fluffiest potato mash sitting underneath a grilled duck breast and while you could taste the half pound of butter that must have been sitting on my plate, the mash was unbelievably delicious, so creamy, so smooth and simply heavenly! Not sure I can go back to mash without butter … although maybe your suggestion of roasting the veg with some olive oil will help! Love the light in the pictures – that light reflector ‘thing’ you bought must be doing its trick (or you have insanely nice light in your new place!). I love that you added chilli to this dish. 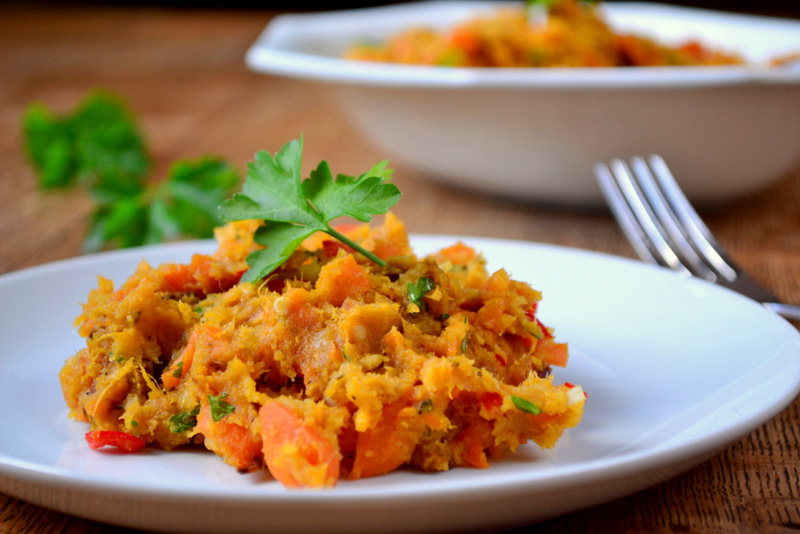 I remember many a holiday meal with some sort of mashed orange vegetable on the side… a boring but totally comforting side dish. The chilli definitely adds some excitment. Thanks – I love chilli. IT does indeed make things a little more interesting! As an American, who resides in Boston, what I absolutely cannot wrap my brain around, is the need for adding marshmallows to sweet potato mash!!!! What is that? In fact, the other day while at Whole Foods, I noticed they had packages of marshmallows next to the sweet potatoes! We Americans are a bit of a puzzle, eh? Thanks :D. I don’t get it either… it makes no sense. You are indeed. Sorry mate, you lost me with parsnips uuuugggggghhhhhh!!!!!!!!!!!!!!!!!! I don;t like parsnips either and this taste good! That’s funny — I just made a soup version of almost exactly this. And I will continue to campaign for the awesomeness of the parsnip. It’s pretty much the only vegetable that’s local this time of year. Awesome! Yes, that is one definite benefit! Thanks so much 🙂 – I shall check it out! Of course vegetables can be endearing. Okra has a special place in my heart, despite it’s unfortunate habit of excreting a slimy substance. Don’t know why but parsnips are not my thing, would you recommend something else that can be substituted? Oh indeed :D. I’ll have to give it a go. You honestly don’t taste the parsnip! Thanks – yes, it sounds pretty well up your street :D. Go ahead! Loving the parsnips in the recipe! I like that it is all mashed. I have never seen anything quite like this; absolutely delicious!